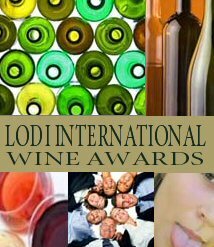 Consumer Wine Awards held in Lodi, California. 2012 competition judging March 17 & 18. United States or the World. Usually, wineries may start entering wines for the competition about January 3.
everyone from beginner to pro. 2010 California State Fair Wine Judging Competition. This three-day competition is expected to bring out the best of the best winemakers. Wines are judged by an elite group of trained judges from across the nation. 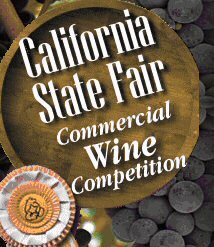 From champagne to zinfandel, judges are expected to sip and spit nearly 3,000 wines, awarding medals to this year’s best of the barrel! Competition judging June 6, 7 & 8. Entry dates for wineries are April 16 to May 4. 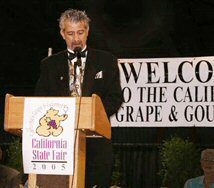 "Wine Buzz: Here come the judges"
Gourmet - and Wine & Dine"
Grape & Gourmet is scheduled to be held on the fairgrounds in Sacramento. Tickets go on sale in May 2012 and can be purchased at the State Fair Box Office or online at tickets.com. Tickets will also be sold at the door. to be a truly extraordinary event for everyone. Competition judging for 2012 TBD. 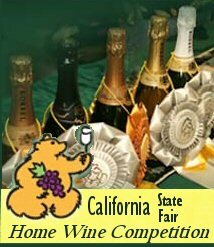 Open only to HOME winemakers that reside in the State of California.